If you like the life at the countryside this farm game is the one for you. Having lots of animals around you is always nice, especially if you can make a living out of it and have lots of fun too. You will start off small, with just a couple of chicken and you have to complete the goals in order to advance to more challenging tasks. Chicken will have to be fed grass in order to lay eggs, so you will need lots of grass, but in order to have plants on the farm, you must constantly buy water from the well so you can water them whenever you need to. Take the eggs from the animals and take them into the warehouse to store them, or if you want, you can put the in the truck and send it to the city in order to sell them. If you have more gold, you can buy more animals and more water, thus increasing your profit and unlocking more animals for you to buy. Use the mouse to take care of the animals on the farm. 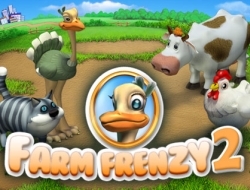 Farm Frenzy 2 0.00 between 0 and 10 based on 0 votes.